Corners bumped and spine creased. A pawn-shop robbery - It's no rest for the wicked as Kate Shackleton picks up her second professional sleuthing case. But exposing the culprit of a pawn-shop robbery turns sinister when her investigation takes her to Harrogate - and murder is only one step behind . 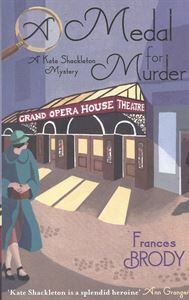 . .
A fatal stabbing- A night at the theatre should have been just what the doctor ordered, until Kate stumbles across a body in the doorway. The knife sticking out of its chest definitely suggests a killer in the theatre's midst. A ransom demand- Kate likes nothing better than a mystery - and nothing better than solving them. So when a ransom note demands £1,000 for the safe return of the play's leading lady, the refined streets of Harrogate play host to Kate's skills in piecing together clues - and luring criminals out of their lairs . . .